The accident happened on Saturday evening 160 nautical miles east of Shanghai. The tanker, operated by Iran's Glory Shipping, was heading to South Korea when it collided with a Hong Kong-flagged cargo ship, the CF Crystal, carrying 64,000 tonnes of grain. 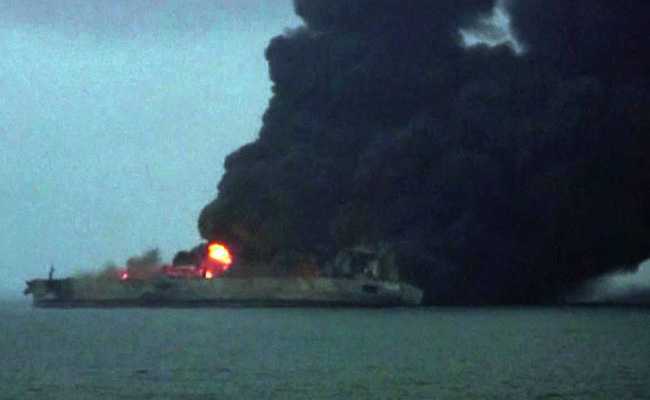 Beijing: An Iranian oil tanker ablaze off the Chinese coast is at risk of exploding or sinking, authorities said Monday, as they reported there was no sign of survivors 36 hours after the vessel erupted in flames. The huge fire still raged around the stricken ship, which had been carrying 136,000 tonnes of light crude oil, with thick black smoke billowing from the vessel and the surrounding sea. Rescuers attempting to reach the crew of 30 Iranians and two Bangladeshis were being beaten back by toxic clouds, China's transportation ministry said. The Panamanian-flagged 274-metre (899-foot) tanker Sanchi is "in danger of exploding or sinking", the ministry said. State broadcaster CCTV posted a video on Twitter showing the fire seemingly under control as a second vessel sprayed it with a water cannon. Rescuers had recovered one unidentified body as of Monday afternoon, foreign ministry spokesman Lu Kang said during a regular press briefing. "Conditions... are not that favourable for search and rescue work," he said, adding that "we are also investigating how to prevent any secondary disaster." The accident happened on Saturday evening 160 nautical miles east of Shanghai. The tanker, operated by Iran's Glory Shipping, was heading to South Korea when it collided with a Hong Kong-flagged cargo ship, the CF Crystal, carrying 64,000 tonnes of grain. Ten government vessels and "many fishing ships" were helping with the ongoing rescue and clean up effort, the transportation ministry said, adding that a South Korean coast guard ship was also on the scene. A US Navy aircraft participated in the search on Sunday, scouring a large area before returning to Kadena Air Base in Okinawa, Japan. As Chinese authorities raced to contain the ship's leaking oil, experts expressed fear that the accident was poised to create a massive environmental disaster. Greenpeace said in a statement it was "concerned about the potential environmental damage that could be caused by the 1 million barrels of crude oil on board." If all of the Sanchi's cargo spills, it would be the biggest oil slick in decades. By comparison, in the sixth-worst spill since the 1960s, the Odyssey dumped 132,000 tonnes some 700 nautical miles off Canada's Nova Scotia in 1988, according to figures from the International Tanker Owners Pollution Federation website. Even under a best case scenario, it would take a "long time" for the area to get back to normal, Wei added. "At present, the only thing to be done is make the best effort to not allow the oil to spread to other places." China had two vessels working to contain the spill early Monday morning, the transportation ministry said in its statement. Iran's Petroleum Ministry said the tanker belongs to the National Iranian Tanker Company (NITC) and was delivering its cargo to South Korea's Hanwha Total. The ship and its cargo were insured, a statement said. This is the second accident in less than two years involving a tanker owned by the NITC. In August 2016, an Iranian supertanker and a container ship collided in the Singapore Strait, causing damage to both vessels but no injuries or pollution. Saturday's collision was the latest in a series of fatal maritime accidents to hit East Asia in recent years. Last October, 13 crew on a Chinese fishing boat were killed after their vessel collided with a Hong Kong oil tanker off Japan's west coast. US Navy vessels have also been involved in some accidents, including a collision between the USS John. S. McCain and a tanker off Singapore last August that killed 10 sailors.